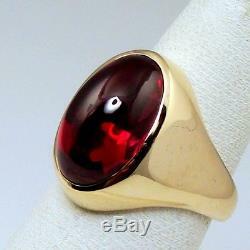 OLD RUBY 10K YELLOW GOLD RING. NOT A COPY OR REPRODUCTION. DEFINITELY FROM THE 1940S 1950S. KNUCKLE TO KNUCKLE (OVER 2/3in)(17.3mm). RING IS IN EXCELLENT CONDITION WITH OVER ALL MEDIUM CONSTRUCTION. EXTRA COMFORTABLE WITH FULL FLUSH BACK. SHANK(BAND) IS GOOD FOR ANOTHER LIFETIME. TESTED AND GUARANTEED SOLID 10K GOLD NO PLATING OR GOLD FILLED. RING SIZE IS NOW SIZE 6 ¾. (I OFFER FREE SIZING TO ANY SIZE). IN SIZING MY RINGS ARE NEVER STRETCHED THE SHANK IS CUT AND A PIECE ADDED OR REMOVED AND RESOLDERED TO THE CORRECT SIZE, POLISHED, SO THE SOLDER LINES ARE NOT VISIBLE. VERY HEAVY WEIGHT FOR THIS SIZE RING. STONE RISES 7.1mm ABOVE YOUR FINGER. THE FINEST LAB RUBY MADE TODAY STONE MADE IN SWITZERLAND - HAND CUT, POLISHED, MOUNTED IN U. THIS STONE WAS CUT FOR THIS RING. THIS STONE NOT LABORATORY GROWN WOULD COST MANY THOUSANDS WHOLESALE. Rubies are the red members of the corundum family of minerals. Any other color--blue, pink, yellow, and many others--is called. USING THE VERNEUIL PROCESS THE RESULTING STONE RESEMBLES NATURALLY GROWN SAPPHIRE IN EVERY WAY INCLUDING HARDNESS, RESISTANCE TO SCRATCHING AND CHIPPING, LOSS OF COLOR, AND MOST OF ALL FINENESS OF COLOR. THE VERNEUIL PROCESS WAS ORIGINALLY DEVELOPED BY A FRENCH CHEMIST, AUGUSTE VERNEUIL IN 1902. THE STONE IS A TRUE RUBY (CORUNDUM) FINEST QUALITY LAB-CREATED AS HARD, SCRATCH RESISTANT, AND HEAT RESISTANT AS ONE FROM THE GROUND ON MOHS HARDNESS SCALE 9 DIAMONDS ARE 10. THIS STONE IS ALMOST SCRATCH-PROOF VERY HARD. EBAYS DEFINITION AND EXPLANATION ABOUT TERMS FOR STONES. What is the Difference between Lab Created, Synthetic and Simulated Gemstones? Lab created, Lab grown and synthetic are synonymous terms. To use either of these terms, according to the FTC, the gemstone must be identical to the natural in every way: Chemical Composition, Hardness, and Optically. Below is an excerpt from the FTC guidelines for gemstone sales for your reference. The key is that Lab Created and Synthetic are identical to the natural. Only difference being it is not from the earth. No Lab Gemstone is RARE, as the rough can be made anytime. Associated with July and of the zodiac sign Cancer. Ruby is associated with the sun in Vedic astrology. Ruby is associated with a 40th wedding anniversary. Rubies have always been held in high esteem in Asian countries. They were used to ornament armor, scabbards, and harnesses of noblemen in India and China. Rubies were laid beneath the foundation of buildings to secure good fortune to the structure. I DO MY OWN PHOTOGRAPHY I DO NOT USE PHOTO SHOP. IF YOUR PACKAGE ARRIVES DAMAGED OR OPEN DO NOT ACCEPT!! IF YOU HAVE SPECIFIC MAILING INSTRUCTIONS, LET ME KNOW. YOUR RING WILL COME IN A BLACK RING BOX IN A WHITE CARDBOARD BOX. Just one of inkFrog's. The item "MENS WOMENS RING ANTIQUE VINTAGE COLLECTIBLE ESTATE DECO RUBY 10K GOLD 10.5gr" is in sale since Sunday, February 14, 2016. This item is in the category "Jewelry & Watches\Vintage & Antique Jewelry\Fine\Men's Vintage Fine Jewelry". The seller is "zyx100" and is located in Miami, Florida. This item can be shipped worldwide.